Striking angles best describes this contemporary design. At the front of the entrance, an attractive half-circle window transom is built above the door. Through the foyer, the kitchen is centered perfectly between the breakfast area and a more formal dining area. The breakfast room leads onto a very large wooden deck through sliding glass doors. The living room features a wood-burning fireplace and is topped by a sloping, open-beamed ceiling. 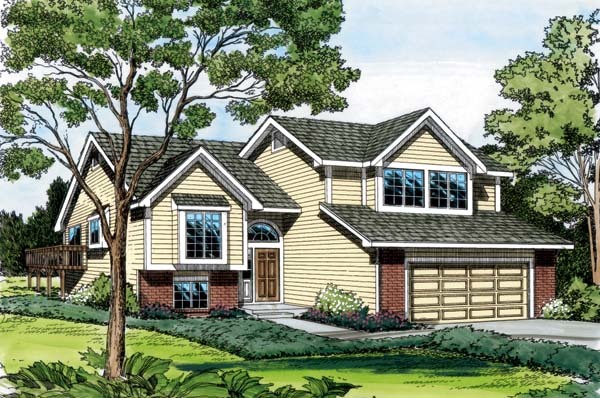 The second level offers two bedrooms with a full bath and a convenient cedar closet. This home is designed with a basement foundation. Exterior Elevations Scaled drawings of the front, rear, sides of the home. Information pertaining to the exterior finish materials, roof pitches and exterior height dimensions. Cabinet Plans These plans, or in some cases elevations, will detail the layout of the kitchen and bathroom cabinets at a larger scale. Available for most plans. Typical Wall Section This section will address insulation, roof components, and interior and exterior wall finishes. Your plans will be designed with either 2x4 or 2x6 exterior walls, but most professional contractors can easily adapt the plans to the wall thickness you require. Fireplace Details If the home you have chosen includes a fireplace, the fireplace detail will show typical methods to construct the firebox, hearth and flue chase for masonry units, or a wood frame chase for a zero-clearance unit. Available for most plans. Foundation Plan These plans will accurately dimension the footprint of your home including load bearing points and beam placement if applicable. The foundation style will vary from plan to plan. Roof Plan The information necessary to construct the roof will be included with your home plans. 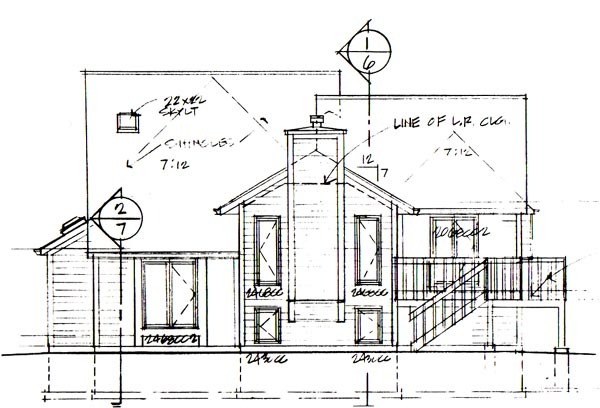 Some plans will reference roof trusses, while many others contain schematic framing plans. These framing plans will indicate the lumber sizes necessary for the rafters and ridgeboards based on the designated roof loads. Typical Cross Section A cut-away cross-section through the entire home shows your building contractor the exact correlation of construction components at all levels of the house. It will help to clarify the load bearing points from the roof all the way down to the basement. Available for most plans. Detailed Floor Plans The floor plans of your home accurately dimension the positioning of all walls, doors, windows, stairs and permanent fixtures. They will show you the relationship and dimensions of rooms, closets and traffic patterns. The schematic of the electrical layout may be included in the plan. Stair Details If stairs are an element of the design you have chosen, the plans will show the necessary information to build these, either through a stair cross section, or on the floor plans. Get your plans fast! A PDF Study Set is a complete set of plans stamped NOT FOR CONSTRUCTION. Not considered a license-to-build. Great for bidding purposes. Customer can upgrade within 90 days.